With the early arrival of our angel “Clare” we were lucky we didn’t leave Rachel’s baby shower any later or we would have had to have it without Rachel or have with Clair being there. We had a lovely day with lots of food, great venue and lots of fun games. Rachel got some beautiful gifts and they are all things that she is now going to need. It’s no secret in our family that Rachel loves getting presents and this day was no different. 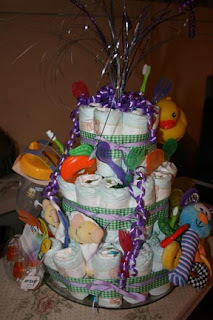 I tried my hand at making a “Nappy Cake” or “Diaper Cake” to my Canadian & USA readers. I am really pleased with how it turned out. Rachel does love getting presents. Davine you did a wonderful job of the diaper cake! The baby shower sure looks like it was a ton of fun. I'm just tickled pink for you Davine, two grand-babies so close together. You are doubly blessed my friend! Oh I agree Darlene - I never have thought a grand child would open my heart so much.